There are some other applications out there which I need to be able to install via script as well, such as SQL Server 2008 R2 Tools; although WebPI (and with Chocolately Beta) can install SQL Tools, you’re actually limited to the express versions (AFAIK), and I need the standard install. Since I have the ISO for this on the network, I can run virtualclonedrive from commandline (after chocolatey installs it) to mount the iso and run the setup application using “vcdmount.exe /l=<drive letter> <iso path>”. It looks like SQL Server has its own command line install options; if I mount the network ISO and pass the parameters “/ACTION=install /IACCEPTSQLSERVERLICENSETERMS /Q /FEATURES=Tools,ADV_SSMS” I should be able to install SQL tools unattended. There is a dependency on Windows Installer 4.5 being installed correctly for this one to work; make sure your WebPI install worked earlier! It looks like VS2010 has its own command line install options; if I mount the network ISO and pass the parameters “/q /full /norestart” I should be able to install VS2010 unattended. There is an entry for “VS2010SP1Core” in the WebPI xml feeds, and I have tried using that to no avail; see “Interesting Things Encountered” section at the end for a note about WebPI & VS2010. "c:\Program Files (x86)\Elaborate Bytes\VirtualCloneDrive\vcdmount.exe" /l=E "Z:\Installation\SetupDevPC\VS2010SP1.ISO"
"c:\Program Files (x86)\Elaborate Bytes\VirtualCloneDrive\vcdmount.exe" /l=E "Z:\Installation\SetupDevPC\SQLServer2008Tools.ISO"
If all goes well you shouldn’t actually see anything of note; VirtualCloneDrive’s VCDMount mounts each ISO into drive “E” (VCD default install has only one virtual drive defined, in my case that was “E”) and calls the relevant executable with parameters to attempt to force a silent install. VS2010 is completely silent! SQL at least gives a few lines of feedback. Unfortunately VS2010’s setup.exe doesn’t wait before returning to the script; as such, you would see the call to VS2010’s setup.exe kick off then a few seconds later a call to SQL2008’s setup.exe, which fails since there’s another install already happening. Again, just as unfortunately, SQL2008 won’t install straight after VS2010 – it demands a restart. My preference is now to install SQL2008 first, since this is a blocking process, then VS2010, then let it restart (remove the “/norestart” flag for VS2010). Although it is entirely possible to script the setup of a develop PC without requiring ever seeing a GUI currently, using the tools I’ve chosen to use here, it seems that it can’t be done in a fully automated fashion. Certain products still popped up a confirmation dialog, others required a reboot when I’d specifically suppressed one. Some dependencies were not always resolved correctly. As such, I hope that you have enjoyed this introduction into my attempt to teach myself some command line WebPI, ninite, chocolatey, and general hackery, and if you have any comments or suggestions please feel free to let me know in the comments or via twitter; I’ve kept various snapshots of my VM I used for this series, so I’ll happily try out any good suggestions! It would appear that this is a nice set of basic scripts to get a development PC up and running, however once this has been done it makes much more sense to create an image and use that for future setups. There will be a follow up post about creating an image of this configured PC so that future developer PCs can use the image instead of having to reinstall everything, which should be a pretty basic one since it’s nothing new! Finally, these articles are already out of date! WebPI is now on v4 and the chocolatey “beta” I mentioned is actually now the mainline. No doubt everything else will be out of date in a few more days. The webpicmdline tool still raises the odd dialog prompting for a restart (e.g. for MVC3), even with the “suppressreboot” option. Using a really loooong product list I’d specified in one webpi command fails for a lot of them. After rebooting, webpicmd didn’t automatically pick up and carry on as expected; this is why I’ve cut the initial webpi product list to a small number and done the others via chocolatey. Webpicmdline doesn’t install things in the order you list them, which can be a bit odd. i.e., WindowsInstaller45 attempts to install after .Net 4 and promptly fails. Do it on its own and you’re fine. Chocolatey’s webpi support didn’t initially work; I had to restart before I could install anything. I believe this to be related to the webpi installation of WindowsInstaller45 whose required reboot I had suppressed. 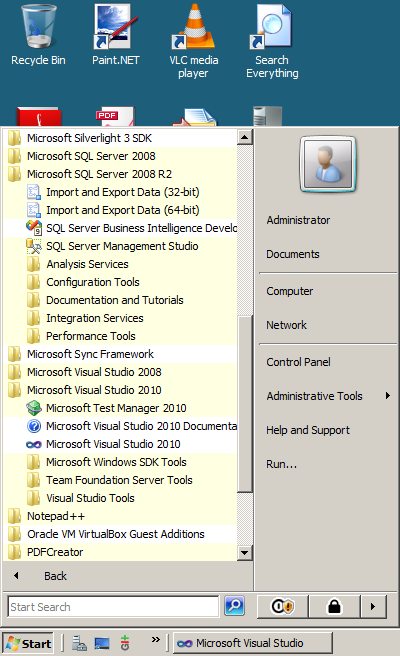 VS2010’s “/q /full” setup options are incredibly “q” – nothing appears at all; no command line feedback, no GUI. I had to fire off setup.exe without params just to see the GUI load and show me it’s already halfway through the install process! Fantastic. VS2010 exists within the WebPI listing as “VS2010SP1Core” but seems to always fail with an error about needing “VS2010SP1Prerequisite”; this product also exists in the same WebPI feed but was always failing to install via webpicmdline and chocolatey for me. Let me know if you get this working! Hope you enjoyed the articles, any feedback is appreciated. 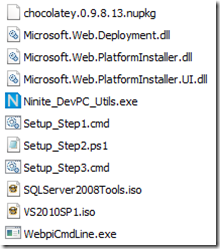 ← Scripting the setup of a developer PC, Part 3 of 4 – Installing.. uh.. everything.. with Chocolatey. Note: I created a scripted install file for SQL and VS so that the installation options are defined in those files. Nice, I like it! Thanks for that. and I forgot to mention, you deserve a monument ! !